Learn the ins and outs of performing a bank reconciliation. Note: For a simple how-to on reconciling your bank or credit card account, please view our article Performing a Bank Reconciliation. We'll provide some solutions for common problems that occur when trying to import transactions from your bank or credit card account. What do you do when your bank feed isn't importing new transactions? The first thing you should try is to refresh the feed. To do this, go to Settings, Bank Feed page. 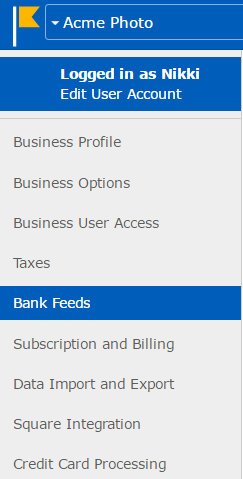 Find your bank feed and then click on Refresh. Some feeds take 24 (or even 48 hours) to refresh, so we recommend waiting at least a day to see whether the feed has successfully refreshed. If refreshing the bank feed doesn't work, please contact our support team. Please do not remove the feed until we have had a chance to trouble shoot it for you. If you Remove and Re-Add the Feed you will end up with 90 days of duplicate transactions. If you uploaded a file and can't see the transactions, the most likely cause is that you've tried to upload the same file twice. This can occur if you remove a bank statement and then try to upload it again. We have duplicate transaction detection in place that does not allow the import of the same transactions twice. The solution is to change the file ever so slightly so that the transactions appear new when you try to import the file. This solution may get too technical for some people, so if you don't understand the steps below, don't hesitate to email our support team the file and we can do the modifications for you. Open up the QFX, OFX, or QBO file in a text editor (like Notepad). These file types may not initially seem openable when you click on them in your computer and you may not get a choice to use a text editor. If that's the case, start the text editor first and then open the file from the editor. Be sure that when you're searching for the file to open, that you make sure it's looking for all files, not only .txt files. Once the file is successfully opened, you'll see a bunch of code. What you want to modify is the <FITID>. Each transaction has one and it acts as a unique identifier. By adding a digit to the <FITID> number, you can make each transaction look new. 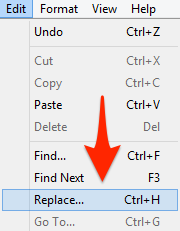 An easy way to add numbers to all the <FITID>'s is to use the Find / Find and Replace function from the Edit menu (the name of the function and where it's found varies depending on what operating system you're using). 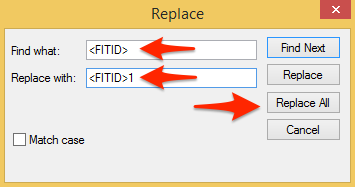 All you need to do is search for <FITID> and replace it with <FITID>1. Adding 1 to the end of <FITID> will change each transaction enough in order for the system upload tool to believe it's a new transaction. Each transactions has a <FITID>, so if you have 20 transactions, you'll need to replace all 20 <FITID>'s. Once you're done changing the <FITID>'s, save the file and try to upload it again. If you're modifying a CSV or Excel file, things are much simpler. Open up the file in your favorite spreadsheet editor. It should be easy to see all your data. All you need to do is add another column. You can title it anything you like, but in order to easily identify it when you import it, we suggest calling it Ignore this column. 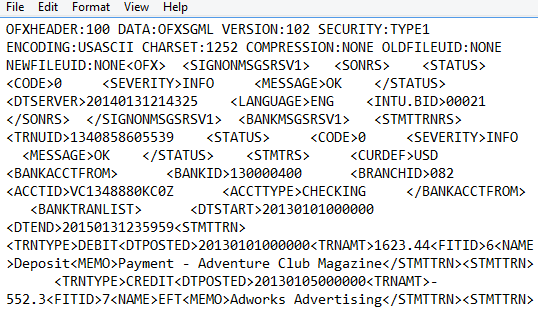 In order to make each transaction appear new, fill the column with dummy data (i.e. put something into each column, like the number 1). Save the file and try to upload it again. Here's some tips on using the Banking page. What you should know, is that bank statement transactions don't affect any of your reports. They are simply used as a tool for verifying entered transactions. Doing either of those things will result in an entered transaction being verified, and thus having a checkmark. What happens though, when an entered transactions on the bottom isn't found in the bank statement on the top? 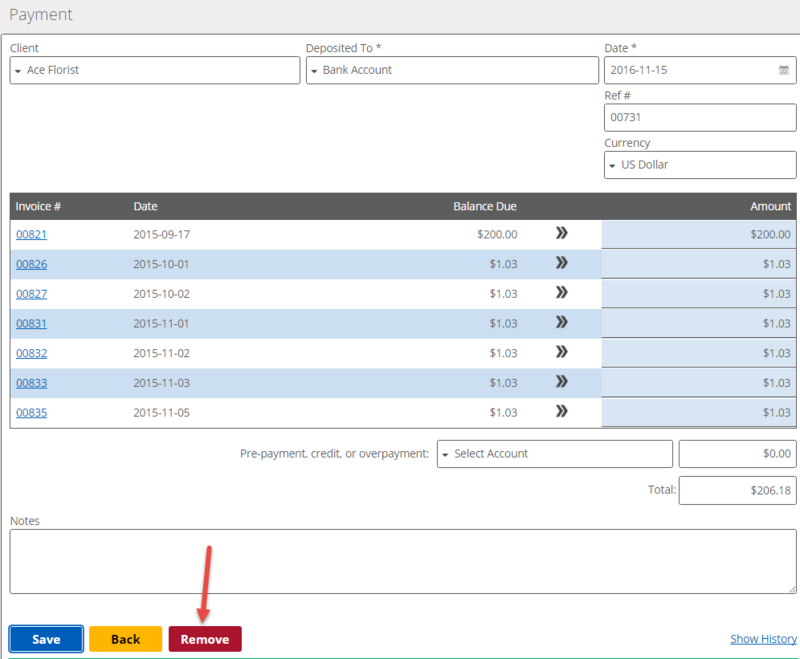 Well, you can copy the entered transaction to the bank statement by clicking on the checkbox to the left of it. By copying the transaction you also verify it. 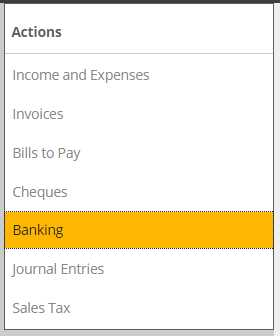 The Banking page is automatically saved, even if you don't hit the Save button, so you don't have to worry about losing your work if you navigate elsewhere. However, if you don't want to navigate away, we suggest opening up a 2nd tab in your browser, going to Kashoo.com, and logging in. Please do remember that if you're working in multiple tabs, you will need to refresh a page to see changes made in another page. If you come across a bank statement transaction for an invoice or bill payment, you won't be able to enter this transaction from the Banking page. However, it's easy enough to go to the Invoices, or Bills to Pay page to record the payment. If you ever have to un-match a bank statement transaction, it's as simple as un-checking the box. When you do unmatch a transaction, the entered transaction remains and doesn't get deleted. There are times when you'll need to edit a transaction. For example, you may need to add more details or split accounts used in a transaction. To edit the transaction, click on the transaction name (it'll be highlighted in blue and start with something like: bill #, transfer #, or invoice #. Basically it's the first part of the transaction link). Clicking on the transaction link will reveal the transaction details where you can then edit the transaction. Make sure to Save the transaction after you edit it. When adding income or expenses, you only have the option to choose one account. If you need to choose multiple accounts, simply enter the transaction using a single account and add it. Once you add the transaction, click on the link to the newly created transaction. From this detailed transaction page, you can add as many line items as you like. Although the field is named Statement Date, you don't have to enter the date of your bank statement if you don't want to. What you're doing by entering a date is choosing what date you want to reconcile your books up until. While you can reconcile as little as one day to over a year at a time, we recommend reconciling no more than one month at a time. We suggest this because if there's an error with your reconciliation, it's easier to sift through a month's worth of transactions than a year's. Something else we should mention about dates is that it's usually best to choose a Statement Date that is at least a day before the present day. This is because bank accounts, and especially credit cards, sometimes have a delay in posting transactions, from a few hours to a few days. Even though there's a Sales Tax field, you won't be able to see the exact tax calculation when you choose one. Not to fret. Once you add the transaction, a link to the transaction will appear. 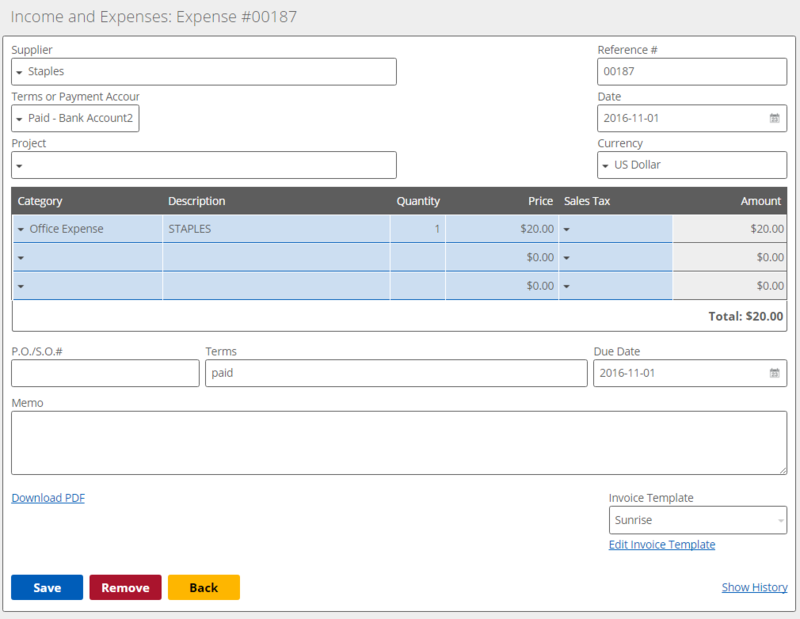 If you click it, it'll bring up the transaction record, complete with a breakdown of the taxes. If you're having problems matching Imported Transactions to Entered Transactions, here are some troubleshooting tips. You may run into a situation where you have a single Imported Transaction that you want to match up to multiple Entered Transactions. A good example is when checks are received from multiple customers and then deposited into your bank at the same time, resulting in a single transaction showing up in your bank statement. Another example is when you have a credit card merchant account that batch deposits multiple customers payments as a single deposit into your bank account. These are both examples of batch deposits. Another situation you may run into, is when you want to match multiple Imported Transactions to a single Entered Transaction. For example, this can happen if you've received multiple payments from a customer, but entered it in as a single payment. To correct this, remove the single payment and enter it as multiple payments. Note: While you can batch and separate transactions so that entered transactions match bank statement transactions, it's not absolutely necessary to do so. As long as the balances match as of a certain date, then you can leave batched and separated transactions as is. The benefit of matching bank statement transactions exactly to entered transactions, is that it makes it easy to identify potential errors when reviewing a reconciliation. When creating transactions, it's easy to mis-enter a number (like $93.54 instead of $93.45) or a date (like 2014-10-14 instead of 2013-10-14). 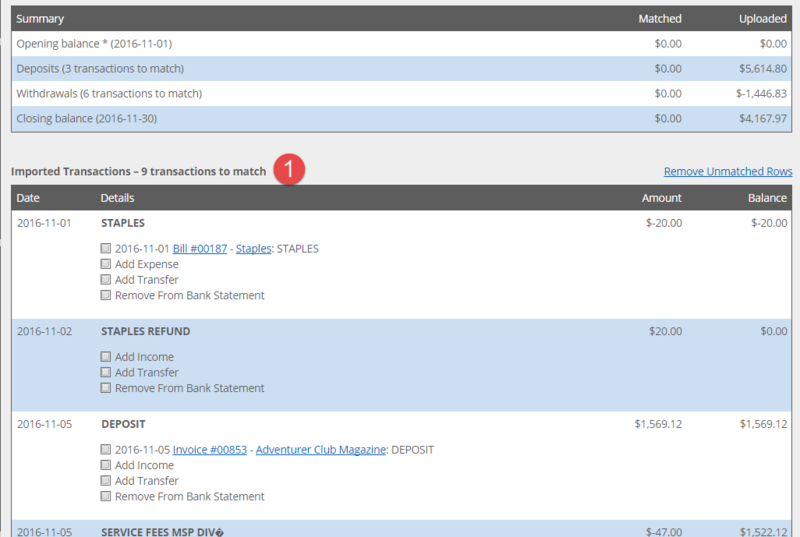 If you have a mis-entered amount, no match will be suggested when you're processing bank statement transactions. To correct this, scan the bottom section of entered transactions to see if you can find a similar looking dollar or date amount. If you find the error, simply click on the transaction, edit it, and save it. Once you've matched all the transactions in the top section that contains your Imported Transactions, the Entered Transactions on the bottom may still not have a match. Here are the most common reasons why. Sometimes you end up with transactions that have been entered twice by accident. If this is the case, you can remove a duplicate transaction by clicking on the transaction link. Once the transaction is open, click on Remove. Then click on Yes to confirm the removal. There are a couple of reasons why entered transactions may not appear in your bank statement transactions. For example, even though you write a check on March 1st, it may not be cashed until June 15th. So, it won't show up in your bank statement until the 15th of June even if you've already entered the transaction into Kashoo. It is also common for credit card transactions to take a few days to a few weeks to be posted in your credit card account. So while you may have entered a credit purchase into Kashoo on a date like March 5th, it may show up in your credit card statement dated a few days after the purchase date, like March 10th. This is normal. In these situations, all you need to do is wait until the transaction does show up as a bank statement transaction and then match it with the matching entered transaction. It's very easy to choose the wrong bank or credit card account when entering transactions. To fix a transaction, click on the transaction link and edit it.